Preventive grub control methods work best. 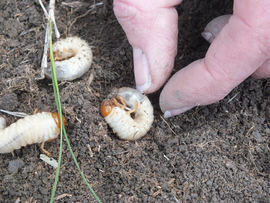 They don't kill existing larger grubs, but will prevent the next generation from taking hold. Curative grub control is the only thing that works right away to kill larger grubs, but preventive measures are best for reducing their numbers overall. To get the best results for your money, be sure to apply the right type of insecticide at the right time of year. Applying it at the wrong time will make it less effective at removing the grub problem. A DIY grub treatment costs about $20 to $30. Professional grub control services typically cost $60 to $75. Grub treatment usually needs to be done once a year.